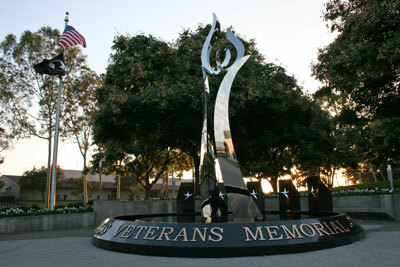 The City of Cerritos proudly dedicates the Cerritos Veterans Memorial in honor of those who have defended our nation’s freedom by serving in the United States Armed Forces. The City thanks the many people of the community, including the members of the Veterans of Foreign Wars, Cerritos-Artesia Post #1846, for their valuable contributions to the memorial’s development. 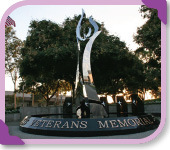 Designed by sculptor James T. Russell, the Cerritos Veterans Memorial consists of a highly polished stainless steel sculpture rising from a 20-foot circular black granite reflecting pool surrounded by five podiums. The podiums are emblazoned with a three-dimensional gold star on the front façade, with the military seal from each branch of the United States Armed Forces placed at the top of the podiums. Russell was chosen to create the memorial as his timeless design features an uplifting expression of spirit and shows respect, honor and dignity to veterans. In addition, the memorial includes a plaque in recognition and appreciation of the United States Merchant Marine recognized by the United States Congress for their military-related service and valiant support of the United States Armed Forces during World War II in active ocean-going service from December 7, 1941 through December 31, 1946. The memorial also includes a plaque in recognition and appreciation of 32 special groups recognized by the United States Congress for their military-related service and valiant support of the United States Armed Forces during World War I and World War II. The memorial is also inscribed in memory of Lieutenant Colonel Mario Carazo. Lieutenant Colonel Carazo lived in Cerritos from age 3 until his graduation from Cerritos High School in 1987, when he entered the United States Naval Academy. He was killed on July 22, 2010 while flying a combat mission over Helmand province in Afghanistan. In addition to developing the memorial, Veterans from Cerritos are encouraged to submit their information for presentation on the website. The City thanks the Veterans of Foreign Wars, Cerritos-Artesia Post #1846 for its assistance with gathering and reviewing material for the website.